Why do we always intuitively say that this part is perfect, which is incomplete by human eyes. What does it depends on? Almost of people said that it mainly depends on whether the product surface finishing is smooth, neat or no burrs etc. Of course, the part design is also crucial to product success. 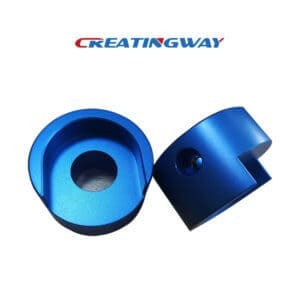 In additional to this, how to choose the best surface finishing for your parts, this is also a problem that we often encounter.Today, Creatingway will take this blog to share more information to you on product surface finishing. Firstly, we need to know exactly what’s your product for? It’s a metal accessories or a disposable. Such as: Bluetooth ear plugs, which is a consumer goods, and be widely used on answer calls, listen to music etc. And Ear plugs can be divided into noise cancelling earplugs, acoustic earplugs, anti-noise earplugs based on the functionality and environment of the parts. Based on different using environments, we need to consider how the surface finishing will be safety, and how to protect it. Who is your product the final user? For construction workers, they will less focus on aesthetics and more on durability and corrosion protection. For many consumers, they will more focus on the part aesthetic and quality of the parts. of course, in that case, the surface treatment needs to be non-toxic as well as durable, especially in the foods aspect. How long do you want the product to last? Generally speaking, if you want to the product extreme durability, except for the quality of raw material, the type of surface treatment is also crucial to the products. Of course, a painted surface is the most easily scratched and faded, then anodizing, powder coating, plating and others so on. Is your product disposable, or durability? Firstly, you need to have a clear understanding before production. When your parts will be used last a lifetime, you need to choose high quality materials and durable surface finish to protect it, all of which will increase costs. Does the raw material match the product surface finish you want? When choosing a material before production, you should research to ensure your surface finish is match with the raw material substrate. Such as: Titanium, which will be very hard to be polished. And the surface of the part is not glossy. Or many other materials, may be some of them can’t be anodizing or painting etc. Will the product surface finish you choose change the part’s dimension? I believe that almost of people know surface finishing can change the part’s dimension. So we need to clear know the raw material will how to match the surface finish, and what is the maximize tolerance of the parts you want. In generally, the normal anodizing tolerance is:+/-0.005-+/-0.01 mm. of course, there are also some thick surface finish, such as: Powder coating, which can increase the surface thickness everywhere they’re applied, and the coating can’t reach deep into cavities or will clog threaded holes, so we have to do secondary processing to get the original specs. Which surface finish is best for your next project? In conclusion, for above all these factors you need to know before product surface finishing. It is key to know who your ideal the final user is, how they intend to use the product and in what environment. And the raw material and machining processing will also have some affects for the surface finish of you choose. What’s the Purposed of Plastic Parts Plating? Why We Do Plating for Plastic Machined Parts?